Macy's summer stretches before her, carefully planned and outlined. She will spend her days sitting at the library information desk. She will spend her evenings studying for the SATs. Spare time will be used to help her obsessive mother prepare for the big opening of the townhouse section of her luxury development. But Macy's plans don't anticipate a surprising and chaotic job with Wish Catering, a motley crew of new friends, or...Wes. Tattooed, artistic, anything-but-expected Wes. He doesn't fit Macy's life at all--so why does she feel so comfortable with him? So...happy? What is it about him that makes her let down her guard and finally talk about how much she misses her father, who died before her eyes the year before? I was doing a book exchange with one of my friend, and she brought me The Truth About Forever and Bloodlines. I was pretty doubtful about this book, because as you all know, I don't read romance a lot, and it seems like another "girl-meets-boy-after-grief-and-fell-in-love" type of story. And yeah, while it is that kind of story, it also gives us more than that. Macy was really reserved at the beginning. Her father just died, and she was the one that found the body. It was a natural death, but it was still a traumatic experience. Her mother works 24/7 to avoid confronting her grief, and her boyfriend Jason is super smart and has a perfect life. That's why her whole life already carefully planned, to meet her mother's expectations and to fit in with Jason's life. One night, in one of her mother's event, the catering they used had a trouble and Macy decided to help. But in the midst of chaos and dissaray, she found something that she didn't realise she doesn't have. There's this guy at the catering names Wes. He's perfect to me. He's the kind of guy bestfriend I want to have (guy bestfriend, not boyfriend). He's handsome but doesn't notice it so he doesn't go over the top with his looks, kind, he learned his lesson, he loves his family, and he has amazing personality. They're friends at first, but then while on catering duties, they started to play "Truth". It's like the game of Truth or Dare, but in this case there is no "Dare" options. I think it's a really great game to get to know each other or learn someone's dark secret and it's exactly what happened with them. The more Mary works at the Wish catering, the more Macy feels like something is wrong with her controlled life. Her mother also started paying attention and worries, not to mention her sister Caroline who deals with the grief face-on and bugs her mom and Macy to do the same. I think this is a really worth reading book. The romance isn't cheesy. It focused more on family and finding yourself, but the romance doesn't quite take the backseat. It's just the perfect mix for everything. And what I love the most about the romance is how we can actually see the process of Macy and Wes romance, and if you look closely, you could see the exact moment they fell for each other. 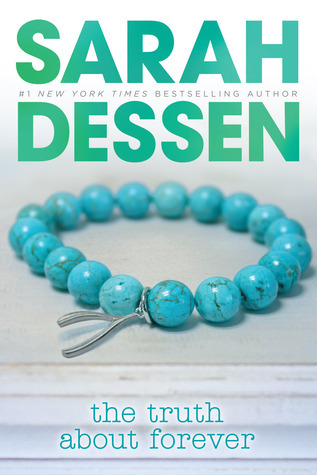 This is my first Sarah Dessen book, and it definitely won't be the last. I also would try to read more contemporary because of this book!